“Dentistry has allowed me to combine my passion for art and physiology. I have always aspired to help people improve their health and well-being. Dr Shah has been helping patients at Anchorage Dental Care for the last seven years, and she understands that visiting a dentist can be an anxious experience for some people. Her focus is on a gentle approach so that patients are more comfortable when they have treatment. Dr Shah received a Bachelor of Dental Science with First Class Honours from the University Of Queensland in 2010 with a focus on periodontology. She has a commitment to upskilling with the latest techniques, and is currently undertaking Comprehensive Othodontics at the International Academy of Advanced Dentistry (IAADent). As well as experiencing the beauty of Africa, Dr Shah made a commitment to the children there, running an oral hygiene education program for children in Cambodia, and a dental camp for children in Mozambique. Back in Australia, Dr Shah continues to support local charity organisations, and is actively engaged with the Edmund Rice Centre, WA. 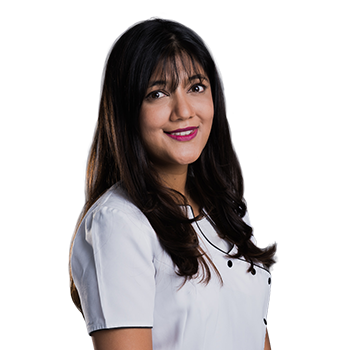 In her spare time, Dr Shah enjoys keeping fit with yoga, and spending quality time with family and friends.